For NKT's Spring Festival 2009 NKT has created a video diary. NKT's choice of a quote purportedly from Nagarjuna (150-250), an Indian philosopher and the founder of the Madhyamaka school of Mahāyāna Buddhism, may be perplexing. 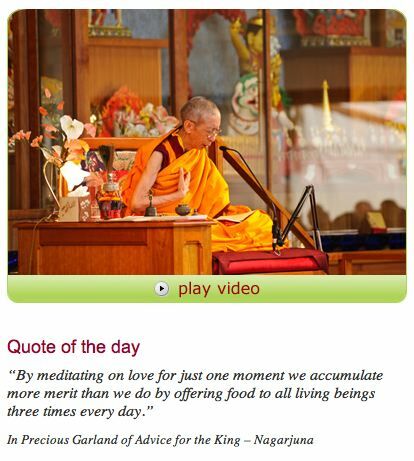 Surely, feeding trillions of living beings three times a day offers greater benefit than meditating even on love for just one moment. Without food there would be no living beings. Without living beings there would be no love. Also, doing love is better than thinking about it (too easily a selfish exercise). The happiness of others is more important than our own. We should cherish others more than our self. What we do should preferentially be about elevating others, not ourselves. Is NKT accurate in its portrayal of Nagarjuna's advice? Or, is NKT paraphrasing Nagarjuna to rationalize why it rarely if ever offers sustenance to living beings (without a fee)? Various English translations are readily available, none of which supports NKT's version. Beds, food, hay, and wood. And take special care to nourish them. You should not partake of them. Sugar, and piles of grain. Ants, birds, and so forth. Clearly, contrary to possible suggestion by NKT, Nagarjuna advise to feed living beings, humans and ants alike. Focusing on 'merit', not liberation, Nagarjuna says offering 300 pots of food 3 times a day does not match the merit derived from one instant of love. In fact, Nargajuna explains that through love we are not liberated but will attain the 8 good qualities of love ("friendliness from gods and humans, protection by spirits, mental and physical pleasures, defense against weapons and poisons, effortless achievement, and rebirth in comfort" (Jeffrey Hopkins drawing upon Nargajuna's paragraphs 284 and 285)). Thus, once again NKT distorts Buddhism to promote its cult of opposition to helping living beings. No wonder Kelsang Gyatso bans Buddhist texts other than his own for NKT. Why won't NKT adhere to Nagarjuna's recommendations above? At NKT, pretending and billing is better than doing and giving.